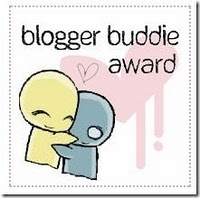 Thanks again to Laura Marcella of Wavy Lines for the Blogger Buddy Award. Question 1 – Where were you five years ago? Graduating with my master’s degree in Mass Communication. Panicking because I didn’t know what happens next. Planning a road trip to the Colorado Rockies for a week of hiking. Following my boyfriend (now husband) to the Midwest where he was finishing up his PhD. Question 2 – Where would you like to be five years from now? Published by a prestigious publisher! Able to tell my friends and family just what is it I do all day. Living in my own house, in the foothills of a mountain, with an office (for me), a garden, and a patio to watch the sunset. Have developed my writing craft to a point I am proud of. Have visited South America, the Pacific Northwest, Boston, and the English countryside. Question 3 – What is (was) on your to do list today? Answer and post this series of questions on my blog. Submit my next pieces to my writing group. Get a mortgage quote from yet another lender. Question 4 – What 5 snacks do you enjoy? Cheese, worthy of cheese plates at fancy restaurants. Nuts: almonds, cashews, and pecans… Oh my! Potato chips, even though I almost never let myself indulge. Question 5 – What would you do if you were a billionaire? Pay off everyone in my family’s mortgage. Give my undergraduate alma mater an endowment for the English Department. If you, dear reader, wants to be tagged, be my guest and be sure to post a link to your response in the comments. I love the idea of getting to know others through reading a series of answers to questions. It tells a lot about people. If you wouldn't mind tagging me I have several other people I would like to share this with. http://www.regina-unsettled.blogspot.com Thank you. Hi, Regina. Consider yourself 'tagged.' Will check out your site and look forward to seeing your answers to the questions. Great answers!!! It's awesome getting to know you better! I enjoyed your list, particularly because I too like looking at my life in groups of five years. In the span of three years I went from partying every night to starting my own family – I can't wait to discover what the next two years will bring!